1989: The third Lazy Cowgirl LP, Radio Cowgirl, is on the rocks, the money man having backed out. The band tells their plight to die-hard fan Long Gone John Mermis. “Why not?” he thinks. Suddenly Johnny’s in the record business. And the name? “I was driving into Hollywood one night thinking I had better come up with a name for this label of mine.” But Sympathy For The Record Industry? “It just popped into my head. My friends all said it was too long to fit on a record, and I thought hat was as good a reason as any to use it.” Luckily the Cowgirls were a hot item and the record sold well. Johnny decided he’d do a few more. There was a series a strong LPs (Jeff Dahl, Crowbar Salvation, and a couple of Australian ones) and then a single–Jeff Dahl backed by the Lazy Cowgirls on “Platypus Man”. That one disappeared real quick. Quick and easy and cheap. He’d try singles for a while. Skimming through the catalog, what is most striking aside from the sheer number is just who has been on a Sympathy record. Besides the Lazy Cowgirls and Jeff Dahl, there’s Claw Hammer (all three albums), Crawlspace, the Creamers, Pigmy Love Circus, Sacred Miracle Cave, Trash Can School, Foetus (AKA the Garage Monsters), Haunted Garage, Hole, Pooh Sticks, Panther Burns, Spacemen 3’s Sonic Boom, the Melvins, Steel Pole Bathtub, White Flag, the Cynics, Tesco Vee, the Honeymoon Killers, Prisonshake, Antiseen, the Dwarves, Muffs, Bad Religion and scads more–a tremendous chunk of today’s alternative underground maybe-they’ll-be-famous-someday rock’n’roll. So what criteria has he for selecting upcoming releases? How does he pick the hits? What of the opinion out there that Sympathy, to some the quintessential vinyl label, is somehow betraying the source of its success by switching to a new technology? “Look, I don’t know if you’ve got a problem with ‘em, but I love CDs. 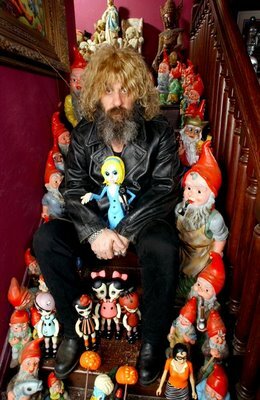 And they aren’t new anymore–they’re already ten years old.” So, with that settled and two discs under his belt, Claw Hammer and the Pooh Sticks, he’s got plans for another six, including the gargoyles, Trash Can School, Pink Slip Daddy, 27 Devils Joking, the Gibson Brothers (recorded at Sun Studios!) and a live Roky Erikson album. Later in the year, look for the magnum opus: a CD collection of his fave Sympathy tracks. So who else on Sympathy does he pick to click? “Trash Can School could be huge. Not that the sound like the Velvet Underground, but they are as coolly obscure as the Velvets were in their own day and I think people will like that…when you think about it, they are just as interesting in their influences as Claw Hammer.” And John insists that everybody loves the Pooh Sticks, from sappy pop fans to crazed punk freaks. We head out to the living room. The first Claw Hammer LP blares out of his daughter Taggy’s bedroom (“She was named after a Wild Man Fisher song.”) A line of those big-eyed Sally No Name begging dolls stretches across the mantel, each wearing a little dress bearing a letter that altogether spell out S-Y-M-P-A-T-H-Y. What does the future hold for John and his label? “I guess from now on I’d like to make a little something doing this,” he says. “It’s been night and day seven days a week for three years now and we are really only getting by. We aren’t rolling in cash like so many believe.” I study the miniature herd of bronze dinosaurs tucked away in a corner, trying not to look at those dolls. Any closing words? ”Just tell them that I’ll keep doing more of the same as long as I’m able,” and he digs through the boxes covering the floor and hands me a thick stack of his latest releases. Photo accompanied an interview with Long Gone John in the excellent blog Turn It Down, which is full of interviews with various rockers of the no commercial potential variety. No photo credit available. This entry was posted in All punk and the punkoid, Story telling and tagged Claw Hammer, John Mermis, Jon Wahl, Lazy Cowgirls, Long Gone John, SFTRI, Sympathy For The Record Industry. Bookmark the permalink.